From Viking Heritage Magazine 3/2002, published by Gotland University. The cult site of Rösaring is located high on a glacial ridge some 40 kilometres northwest of Stockholm, in the municipality of Upplands-Bro. It has ancient cairns and a stone labyrinth, together with what makes this site like no other in Sweden - a well-made roadway running north south along the ridge for over half a kilometre (fig.1). A single carbon dating at one end of the road points to the Viking Age. The site provides the best setting yet discovered for fertility rites and wagon ceremonies as described by the Roman writer Tacitus for the goddess Nerthus. It was in the summer of 1952 that I first set foot on Rösaring. Just one week earlier I had moved to the district to start my job as schoolteacher and church organist in the little parish of Låssa, never guessing that I was to stay on until 1993. Maybe it was the fascination of a region rich in ancient sites and relics that made me stay. I set about learning all I could, talking with my new neighbours as well as reading books on history and archaeology. At first this was just in order to teach local history, but in 1968 I was appointed local representative to the National Board of Antiquities, and then in 1977 came a special three year project on history and local identity coordinated by the National Board of Health and Welfare. During the 1980s I was asked to write a broad-based history of our community, and since 1987 I have been working along with many others on a voluntary basis, within the Upplands-Bro Research Institute for History of Culture (UKF) – on excavations as well as publications. As guide for the Rösaring site, I have long been in close contact with new discoveries and gradually evolving ideas about how the site was once used. Much has happened there in the past 50 years. The cult site of Rösaring has attracted many people through the ages, and has been reported by scholars since the 1670s. Unlike other cult sites, no church has ever been built on it, and today it is remote from major centres of population. Rösaring is situated on a high part of one of the largest glacial ridges in Scandinavia, some 60 m above present sea level and 40 m above surrounding forests and farmland, with a magnificent view over the waters of Lake Mälaren. During the Stone Age, when the future site of Stockholm was still well under the sea, the Rösaring site would have been a small island far out in the archipelago, not suitable for permanent settlement. But during the Bronze Age, as the land freed from its burden of ice continued to rise from the sea, people would have been able to establish themselves on the fertile soils around the base of the ridge, using the ridge itself for burials and ceremonies. This pattern of use would fit well with the observation of the Roman Tacitus, writing of the Germanic peoples to his north about 2000 years ago, that they worshipped the gods in the open air, not hiding them behind walls. The cult site is thought to have been in use since the Bronze Age, mainly due to the appearance of the as yet unexcavated cairns. Not far from the cairns and taking up a prominent position at the south end of the ridge is an unusually large and complex labyrinth made up of small stones (fig.2). The name Rösaring is made up of röse, meaning pile of stones or cairn, and ring, as in the rings of a labyrinth. This labyrinth was listed in 1994 as one of the oldest in Scandinavia, and may date back to early Iron Age or even late Bronze Age. Yet labyrinths made up of small loose stones are difficult to date with certainty, and the only relevant carbon dating sample so far obtained for the entire cult site of Rösaring came from the well-made, 3 m wide roadway, which runs from the southern end of the site with its cairns and labyrinth, northwards along the ridge-top for 540 m. The roadway is unique in Sweden and may have been used for ceremonial purposes. The carbon sample was taken at the southern end where the road meets a large, flat-topped earth mound, and its date points to the early Viking Age. Up to the 13th century Lake Mälaren was a bay of the Baltic Sea. 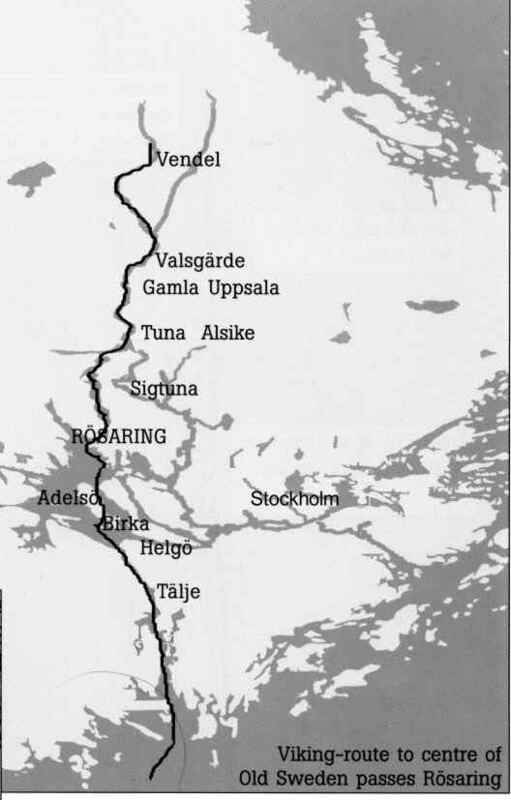 One of the main Viking sea routes passed Rösaring, on the way to Uppsala and Vendel (fig.3). Today, people travelling by road past the church of Bro may notice a rune stone with an inscription using the very word “vikings”. This rune stone tells us that a man called Assur had the role of watching out for Vikings (landvärnare mot vikingar), and that his widow built a bridge (bro) as a memory of him. Fig. 3. Viking route to rhe centre of old Sweden passes Rösaring. From UKF. It is rare that the word “vikings” is recorded at all in old texts, and here it suggests that they were outsiders to the community, and to be feared. Studies of ancient cemeteries at the base of the Rösaring site show that this area was well populated over a very long time. The ceremonial road was an extraordinary find. Although the entire cult site been investigated by professionals for centuries, it was a local amateur archaeologist who reported the road, in 1979. 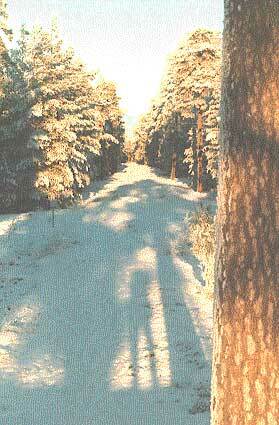 Overgrown with sparse pine forest, the roadway was still relatively intact for its whole length. It was excavated in 1981- 82 by a group of amateurs, led by David Damell. They found it to be bordered on both sides by rows of small stones, and surfaced with a mixture of clay and sand. Along the west side, a ditch was visible. On the east side were about a hundred shallow round depressions, each about 1 m in diameter and 4 to 5 m apart. At the north end was the stone base of a small rectangular building. At the south end, the flat-topped earth mound had tended to spread down on to the road after a thousand years of rain, so that the road seemed to lead into it. This is why the first interpretation was of the road being for a funeral procession, with the mound used for burial of some important dignitary after the body had been prepared in the building at the northern end. 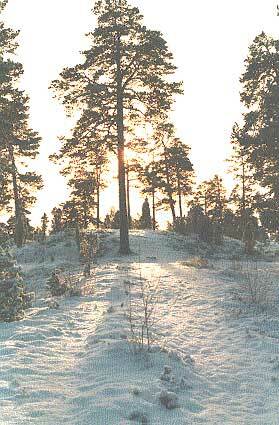 But in 1985 in Old Sigtuna, not far from Rösaring, another flattened mound of similar size was examined. It too had been thought to be a king's grave but proved to have been a mound for a district court or thing (tingshög). Future excavations of the mound at Rösaring may show if it too was just a platform for ceremonies. If so, it is likely that the road was used repeatedly, maybe for some other purpose than burials. There are three factors indicating a fertility cult at Rösaring. First, labyrinths are often connected with fertility through stories in which they are the scene of meetings in springtime between male and female, or earth and sky deities, thus beginning each year’s new cycle of vegetation and growth. Second, the roadway suits wagon ceremonies, such as of the fertility goddess in the wagon described by Tacitus. Third, place names in the neighbourhood also call attention to a fertility cult. About 5 km from Rösaring we find the names Härnevi and Ullevi, which refer to the female earth goddess Härn (Nerthus) and her male counterpart Ull, a sky god, both from the period before the Viking Age. 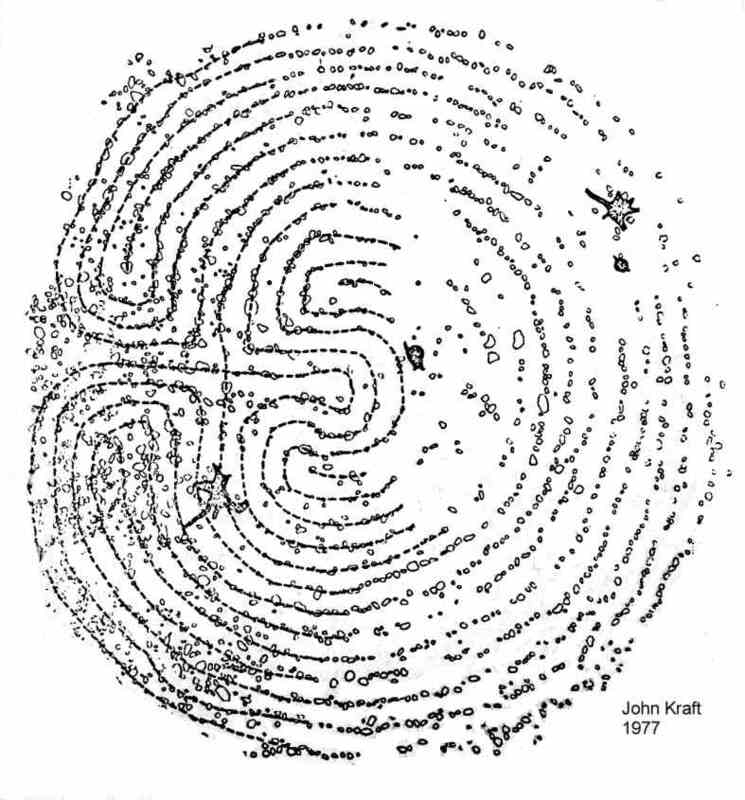 A similar pattern of place names is to be found near all labyrinths lying on ridges crossing Lake Mälaren, as shown by John Kraft in a book published by UKF in 1999. The labyrinth at Rösaring was associated with ancient gods already in 1684, when Hadorph, known as the “father” of Swedish antiquarian research, wrote: “… on a high hill … where there is a Troijenborg ... there has been much sacrifice to the gods in olden days”. Labyrinths in Sweden have long been called “Trojeborg” (City of Troy), pointing to a link with Mediterranean countries, where such labyrinths were common before the Roman Empire. The Minoan culture of Crete even used labyrinths as symbols on their coins. Beside the labyrinth on the famous Etruscan vase from Tragliatella is written a name meaning Troy. Full scale or field labyrinths in these countries have not survived. There are some turf examples elsewhere in Europe, but today the majority of field labyrinths are in Scandinavia. Here they tend to survive more readily, being built of stones in a sparsely populated country. Most Swedish labyrinths are near the coast, built during recent centuries for quite different reasons to the 20 or so labyrinths found inland on ancient sites, such as Rösaring. Typically, these labyrinths have only one path leading to the centre - a round, winding pathway defined by 8, 12 or 16 rings of small stones. Mazes with blind paths did not appear until the 15th century. The historical form of labyrinths is said to be a symbolic city or castle, (borg in Swedish) from which a woman had to be liberated. The Homeric story of a ten-year siege to free the fair Helen of Troy may be a relatively recent tale, based on the original ancient myth in which the woman in question was a fertility divinity, to be delivered with symbolic rites from her winter prison at the start of spring. We do not know for certain how this was done - no doubt it was in many different ways in various places and times, according to tales from all over the world. It is worth noting that in the church of Sibbo in Finland, a picture of a labyrinth includes a girl at the centre. Fertility gods appear as wagon-gods in many old cultures around the world. Wagons need roads, and there could hardly be a better setting for the ceremony of taking out and/or putting away such a wagon than Rösaring - the only place to date where a suitable roadway has been found so clearly marked in connection with fertility cult. Many reports of wagons and their gods from other times and places can help us imagine how the site might have been used. Scandinavian examples continue into Christian times, with wagon burials and the crop-blessing processions of St. Eric. Relevant recent publications in Viking Heritage 1/2002 are “The woman on the wagon” by Jörn Staecker and “Freyja - a goddess of love and war” by Britt-Mari Näsström. In my presentations of “the Rösaring story” I often use Tacitus' description of the cult of the wagon-borne earth goddess Nerthus, thought to be the forerunner of later wagon-gods. I also include the processional wagons shown on the tapestry of Oseberg together with an image of a goddess and her attendants (Norway, 9th century AD). More examples are found in the writings of Ström and Frazer. Tacitus admired much in the native culture of the peoples of Germania. He described their "invisible" goddess Nerthus who travelled at special times among the people in a covered wagon, which was kept in a sacred grove on an island in the sea (… in insula Oceani… in the Latin version). Before the wagon was returned to the grove, it underwent ritual cleansing in a secret isolated lake, carried out by slaves who were then drowned in the lake. Tacitus mentions seven tribes of people worshipping this fertility deity, somewhere to his north. Scholars have not identified the place; suggestions have been made, but there are some unclear points in his text. Tacitus never went to Germania, and his report was based on the tales of others. For anyone wishing to speculate further in the matter, there are two vital points to consider in his story. First, is it possible to identify an island that was an important cult centre at least 2000 years ago, located in an ocean or sea? Second, is it possible to find there a secret isolated lake, where the slaves might be drowned when they had done their duty? Over the years I have entertained my audience with the following proposal. "… on an island in the sea". To the Romans all of Scandinavia was in an ocean, and the Baltic Sea was simply an ocean extending northwards. 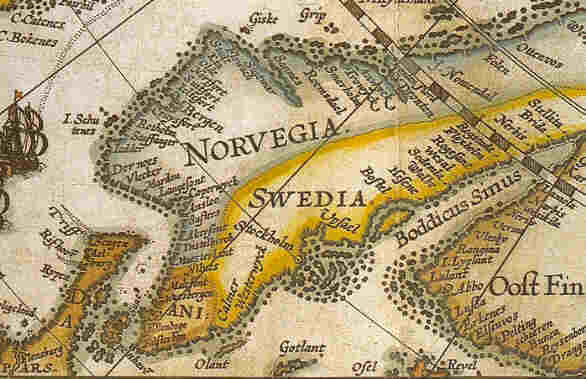 The earliest maps of Scandinavia that were drawn in continental countries were based on sailors’ tales. When I first saw Willem Barents’ map from 1598 (fig. 4), I was astonished because it still showed Lake Mälaren as a bay of the Baltic – a full 300 years after the bay had become a lake, cut off by the rising land! He showed Stockholm and Uppsala as if separated by an archipelago. If Lake Mälaren was regarded as a bay even then, how might it have been thought of when Tacitus wrote his book in 98 AD – a full 1500 years earlier, when the sea level was at least 10 m higher! Perhaps Tacitus, like Barents, based his story on information a few hundred years out of date. The hilltop on which Rösaring is located really was an island in the sea at that time. Note that to this very day, all of Upplands-Bro is connected to the mainland by stretch of land only 2 km wide. Could it be that we have here Tacitus' island in the sea? "… a lake, lying in secret isolation". At the end of Tacitus' story, he describes a special lake where the slaves were sacrificed. Alf Önnerfors in 1960 translated the original text as: “a lake lying in secret isolation”, Per Persson in 1929 used the words: “in a remote lake”, and Hammarstedt in 1916 translated the phrase as "a solitary and well-concealed lake" (author’s translations from Swedish). If we consider sea levels at Rösaring about 2000 years ago, we find a strange-shaped, almost enclosed bay 1100m directly north of the ceremonial road (fig.5). It resulted from an unusual geological phenomenon. When the glacier that originally formed this region was about 2 km thick, the gravel, sand and boulders being pushed forward in a watery tunnel under the ice were blocked in their flow by an enormous clump of ice. This “iceberg” gradually melted, leaving behind a cavity. The lower part of this cavity is now a small bay of Lake Mälaren and the upper part is a narrow valley called Djupdal (Deep Valley). When standing at the bottom of Djupdal, you are surrounded on three sides by impressive steep slopes 25 metres high, and can see the present lake about 200 m away to the north. Of course there would have been other bays and inlets here 2000 years ago, one of them even nearer the processional road, to its east – but all of these would have been too wide and open to be described as any kind of lake, let alone secret or isolated. The cult site of Rösaring has all the elements which make it an ideal setting for Tacitus’ story: a unique ceremonial road suited to wagons, a platform mound at the open southern end and a wagon shed in the forest to the north, beyond which lay a steep sided, almost enclosed, secluded “lake” for the last part of the ceremony, in which the wagon and the covering were cleansed and slaves drowned. Tacitus mentioned one wagon location and seven tribes, none of which has been convincingly located by any researcher. His description of the northern parts of Germania as “girdled by the sea, flowing around broad peninsulas and vast islands” applies to a very large region. Fig.5. From a modern map, contour interval 5 m. The strange valley of djupdal lies 1100 m north of the ceremonial road, which points directley towards its centr. Could this be the reason for the alignment of the ceremonial raod? But if we turn from his text to present-day evidence of place names and land forms, we cannot ignore the possibility that tribes in the Mälar valley worshipped Nerthus, and that Rösaring, being readily reachable by sea and suitable in so many other ways, was a keeping-place for a wagon of Nerthus – maybe even the place that Tacitus was writing about. Rösaring should at any rate not be omitted from future discussions. People continue to be attracted to Rösaring, testing new ideas. In the 1980s came dowsers, mapping patterns of earth forces shown by their divining rods, followed by others with various kinds of electronic equipment, some of which gave similar results. In the 1990s, a group of researchers led by Swedish astronomer Curt Roslund studied the ceremonial road at Rösaring and its near north-south alignment in relation to the sun, the moon, the Milky Way and the rainbow. Their reports can be found on UKF’s website (in English, 1997) and in the European Journal of Archeology, April 2000. Rösaring is indeed a fascinating place. Even for those unfamiliar with its history and archaeology, its unusual geology and natural beauty are great attractions. Its geology also helps us to put forward interpretations of past uses of the place, especially important because the first written reports of Sweden’s geography and history are not fully reliable; they came from people who were never there. The past 50 years have seen many discoveries at Rösaring, the grandest of all being the ceremonial road that lay intact but unnoticed for centuries. Interpretation of the site has also changed, and if investigations continue, there may be more surprises in store over the next 50 years. Photo 2. Looking north along the ceremonial road from the flattened mound. How to get to there: Låssa and Rösaring are about 5 km west of the township of Bro, which is half an hour by train from Stockholm Central Station. Language revision by Heather Robertson. Tacitus' report of th goddess Nerthus. From Germania, ch, 40. in Tacitus: The Agricola and the Germania, Penguin Classics, 1970. David Damell. Rösaring and a Viking Age Cult Road. In Archaeology and Environment 4. 1985: 171-185. In Honorem Evert Baudou. John Kraft. The Goddess in the Labyrinth. Åbo Academy 1985. James Frazer. The Golden Bough. 1922. Folke Ström. Nordisk hedendom; tro och sed i förkristen tid. 1967. Britt-Mari Näsström. Fornskandinavisk religion; en grundbok. 2002. Oskar Lundberg and Hans Sperber. Härnevi. 1912. David Damell. Vi måste samarbeta med hembygdsfolket. Populär Arkeologi 1983:4. Börje Sandén. Det hände i Upplands-Bro; en hembygdsbok. 1984. New issue in preparation 2002. About the author: Börje Sandén has taken part in many community projects alongside his work as teacher and musician, including concerts in historical settings, computerisation of local history records and a book-on-demand publication system. Four books include the “Vad hände egentligen?” series (1990-93) showing the impact of local history on the early development of democracy in Sweden.